Get into an all-Filipino food affair and start your gastronomic haul with Gerry’s Grill SOLO SPECIALS Promo 2019. Tired of the usual burger, pizza or fries for lunch? Why not embark on a belly-satisfying food trip that’s made even more affordable. Gerry’s Grill SOLO SPECIALS Promo 2019 lets you taste the most spectacular flavors of our all-time favorite Pinoy cuisines. Pick up your utensils and dig with gusto on hefty servings of Pork Barbecue (Php205), 2-pc. Fried Chicken (Php225), Lumpiang Shanghai (Php195), Chicken Kebab (Php225), Sisig (Php205) and Inihaw ng Liempo (Php205). Gerry’s Grill SOLO SPECIALS are served with a glass of Iced Tea and a choice of Pinakbet, Pancit Canton or Palabok. The promo is available from Monday to Friday, all-day and all-night, except for HOLIDAYS. The price is already VAT inclusive, plus 5% service charge. The offer is valid for both dine-in and take out and delivery transactions. So, tag your food trip buddy and visit the Gerry’s Grill branch near you. 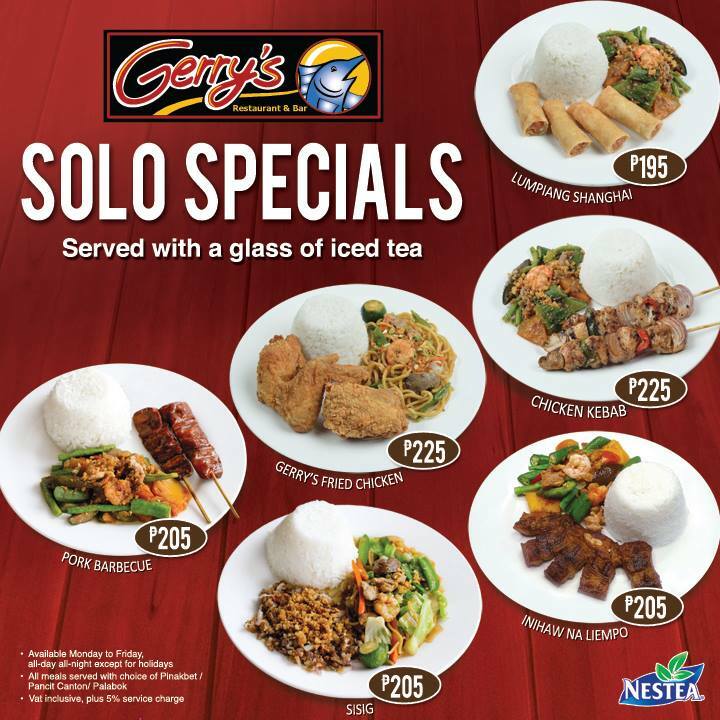 Please visit http://www.gerrysgrill.com/ph/#branches for the complete list of our branches . You may also dial 332-1111 to place your order.